Steven L. Kleiman, Professor of Mathematics at the Massachusetts Institute of Technology, turns 60 on March 31, 2002. Professor Kleiman is a leading figure in commutative algebra and algebraic geometry, having made seminal contributions in subfields including motivic cohomology, moduli problems, and intersection theory and enumerative geometry. With 28 doctoral students and 19 non-student collaborators, Professor Kleiman has served as teacher and mentor to mathematicians throughout the world. This conference is intended to be a tribute to the care with which he has nurtured mathematics and mathematicians. 9:00-9:50 -- Henning Haahr Andersen [Aarhus], The strong linkage principle for quantum groups at a root of unity. 10:30-11:20 -- Trygve Johnsen [Bergen], Curves on Calabi-Yau threefolds. 11:30-12:30 -- Susan Colley (email) [Oberlin], Multiple-point theory: old and new. 14:00-14:50 -- Sebastià Xambó-Descamps [Catalunya], Completing Hermann Schubert's work on the enumerative geometry of cuspidal cubics in P3, abstract. 15:30-16:20 -- Eduardo Esteves [IMPA/MIT], Pfaff systems of equations: singularities and solutions, abstract. 16:30-17:20 -- Dan Grayson (email) [Illinois], Motivic cohomology and K-theory. 9:00-9:50 -- Angelo Vistoli [Bologna], Stacks of double covers of projective spaces. 10:30-11:20 -- Bernard Teissier [Paris 7], Valuations, deformations, and toric geometry. 11:30-12:30 -- Lawrence Breen [Paris 13], Combinatorial differential forms. 14:00-14:50 -- Abramo Hefez [IMPA], The Iterated Osculating Developable of Projective Curves. 15:30-16:20 -- Anthony A. Iarrobino [Northeastern], Some families of Artinian Gorenstein algebras, and the Hilbert scheme of curves on P3. 16:30-17:20 -- Dan Edidin (email) [Missouri], Riemann-Roch for quotients and Todd classes of simplicial toric varieties. 17:30-17:55 -- Knud Lønsted [EU - Brussels], Mathematics and software engineering in the EU-R&D Sixth Framework Program. 9:00-9:50 -- Herb Clemens [Utah], On subvarieties of general hypersurfaces of complex projective space. 10:30-11:20 -- Ravi Vakil (email) [Stanford], Vanishing of cohomology classes on the moduli space of curves. 11:30-12:30 -- Israel Vainsencher [UFPE] Counting hypersurfaces with up to six double points, abstract. 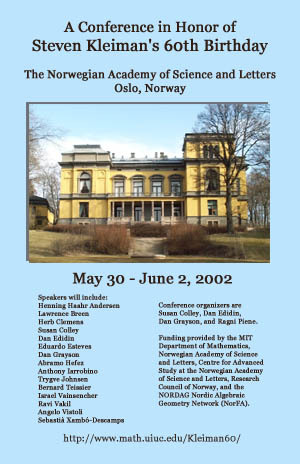 Attend the Abel Bicentennial Conference, June 3 - 8, 2002, at the University of Oslo. If you are attending the Abel Bicentennial Conference, you may prefer to book your hotel through them. The Pension: 450 NOK per night with toilet and shower; or a cheap room at 350 NOK per night, with two showers and one toilet down the hall shared by a maximum of 21 people. Tulip Inn Rainbow Frogner Hotel, the nearest to the Kleiman Conference; 580 NOK per night with the SCAN+ pass, which can be bought for 90 NOK. Tulip Inn Rainbow Gyldenløve Hotel, the only one on the Abel Conference hotel list that is within walking distance of the University campus where the Abel Conference takes place. Convert Norwegian Kroner to US Dollar Euro Afghanistan Afghani Albanian Lek Algerian Dinar Angolan New Kwanza Argentine Peso Aruban Florin Australian Dollar Austrian Schilling Bahamian Dollar Bahraini Dinar Bangladeshi Taka Barbados Dollar Belgian Franc Belize Dollar Bermudian Dollar Bhutan Ngultrum Bolivian Boliviano Botswana Pula Brazilian Real British Pound Brunei Dollar Bulgarian Lev Burundi Franc CFA Franc BCEAO CFA Franc BEAC Cambodian Riel Canadian Dollar Cape Verde Escudo Cayman Islands Dollar Chilean Peso Chinese Yuan Renminbi Colombian Peso Comoros Franc Costa Rican Colon Croatian Kuna Cyprus Pound Czech Koruna Danish Krone Djibouti Franc Dominican Peso Dutch Guilder Euro Ecuador Sucre Egyptian Pound El Salvador Colon Estonian Kroon Ethiopian Birr Fiji Dollar Finnish Markka French Franc Gambian Dalasi German Mark Ghanaian Cedi Greek Drachma Guatemalan Quetzal Guinea Franc Guyanan Dollar Haitian Gourde Honduran Lempira Hong Kong Dollar Hungarian Forint Iceland Krona Indian Rupee Indonesian Rupiah Iranian Rial Irish Punt Israeli New Shekel Italian Lira Jamaican Dollar Japanese Yen Jordanian Dinar Kampuchean Riel Kazakhstan Tenge Kenyan Shilling Korean Won Kuwaiti Dinar Lao Kip Latvian Lats Lebanese Pound Lesotho Loti Liberian Dollar Lithuanian Litas Luxembourg Franc Macau Pataca Malagasy Franc Malawi Kwacha Malaysian Ringgit Maldive Rufiyaa Maltese Lira Mauritanian Ouguiya Mauritius Rupee Mexican Peso Mongolian Tugrik Moroccan Dirham Mozambique Metical Myanmar Kyat NL Antillian Guilder Namibian Dollar Nepalese Rupee Netherlands Guilder New Zealand Dollar Nicaraguan Cordoba Oro Nigerian Naira Norwegian Kroner Omani Rial Pakistan Rupee Panamanian Balboa Papua New Guinea Kina Paraguay Guarani Peruvian Nuevo Sol Philippine Peso Portuguese Escudo Pound Sterling Qatari Rial Romanian Leu Samoan Tala Sao Tome/Principe Dobra Saudi Riyal Seychelles Rupee Sierra Leone Leone Singapore Dollar Slovak Koruna Slovenian Tolar Solomon Islands Dollar Somali Shilling South African Rand Spanish Peseta Sri Lanka Rupee Sudanese Dinar Suriname Guilder Swaziland Lilangeni Swedish Krona Swiss Franc Syrian Pound Taiwan Dollar Tanzanian Shilling Thai Baht Tongan Pa'anga Trinidad/Tobago Dollar Tunisian Dinar Turkish Lira US Dollar Uganda Shilling Ukraine Hryvnia United Kingdom Pound Uruguayan Peso Utd. Arab Emir. Dirham Vanuatu Vatu Venezuelan Bolivar Vietnamese Dong Zambian Kwacha Zimbabwe Dollar (and also to US Dollars, Euros, British Pounds, Japanese Yen, German Marks, French Francs, and Swiss Francs).